The saga of the kittens is both happy and sad. The sad news is that the mother had 6 kittens and only two are left. The mother cat was too young and inexperienced we figure. This was probably her first litter. She divided the litter after we found her in the attic. Who would have thought you could by formula for kittens? We removed the one from the attic and had this trio for a day. Deborah and Elizabeth took it upon themselves to be feeders of kittens. At one point hey had the little black and white one on the grass in the yard and the mother cat came up and swiped it away. We don't know what happened to the first three kittens of the litter but we found the decapitated body of one of them under a bush about ten feet from the opening of the fire escape. A day later we found the decapitated body the black and white one in the same spot but the former body had disappeared. We can only assume that the mother or one of the father cats had killed the litter off. I don't understand the ways of cats and don't plan on studying them at this point. There was much wailing and gnashing of teeth but Elizabeth got over it. She got her first dose of how cruel life can be. The two remaining kittens were fed every morning and evening and any time in between if we were able to. They really needed attention every 2 hours but that was impossible. They weren't going to die though. 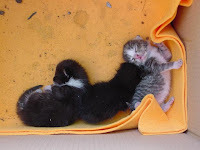 After about a week our mail delivery person rang the doorbell and told us that her neighbor fosters cats for SICSA (Society for the Improvement of Conditions of Stray Animals). After a phone call we were also informed that the neighbor was currently fostering a nursing mother with four kittens. Within a day or so after that our two abandoned kittens were placed in a home where they could learn to be cats. I would like to thank the federal government (via the USPS) for their support in relocating these two orphans. When and if we ever catch the mother we are going to get her fixed and release her. Maybe I should issue a Mayor's Proclamation. I certainly need to cover that hole in the roof of the fire escape before I have a case of Deja vu! Wow. They say feral cats are different, and it really is true. 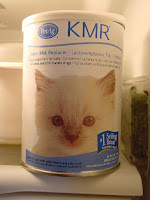 My kittehs' feral mother got them weaned before she turned up dead, which put me ahead of things for taking care of them. My ex had a cat who disappeared once. He found her a few days later, on the side of his driveway, decapitated.